Buy works – Gorbatov Konstantin Ivanovich | (1876, Samara province – 1945, Berlin). Gorbatov Konstantin Ivanovich (1876, Samara province – 1945, Berlin). Konstantin Gorbatov studied in Samara under F. Burov and A. Yegorov in the early 1890s and entered Baron Stieglitz’ Central School of Technical Drawing in 1895 to change to the Construction department of the Riga Polytechnic College in 1896 while continuing his training as painter under D. Clarke. After entering the Department of Architecture of the Academy of Arts in 1904, he soon changed to the Painting Department and studied there under V.E. Dubovskoi and A.A. Kiselev from 1905 to 1911. For his picture "Arrived!" (1911) the artist was awarded the title of painter, a foreign journey and an International Gold Medal of the Munich exhibition. He traveled to Europe in 1912. 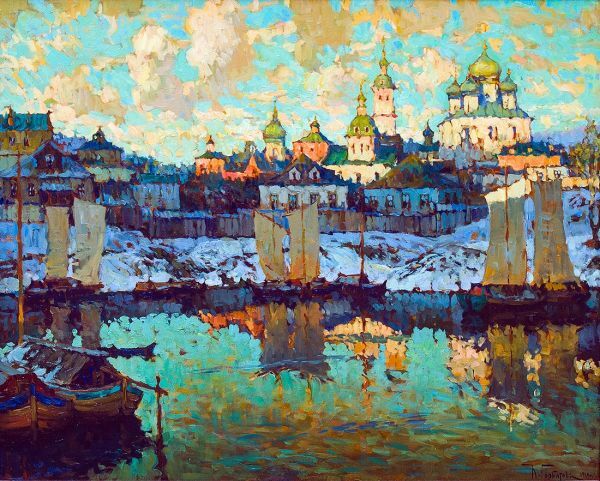 After returning to Russia he painted landscapes and cityscapes of towns in the Northern Russia and on the Volga river. 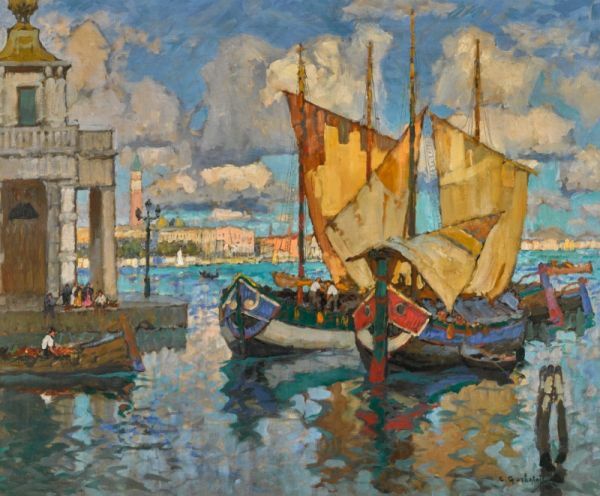 In 1922 Konstantin Gorbatov left Russia and settled down in Berlin. By his will, all his pictures were passed to the Academy of Arts in Leningrad after his death. They are currently kept in the Moscow Province Museum of Fine Arts in Novy Ierusalim. View of the harbor. Sunset. Sogned and dated lower right. Signed in Latin l.r. Further signed and titled on the reverse and bearing a Galerie Del Vecchio label on the stretcher. Technique: Paper on pasteboard, charcoal, water-colour. 650000 - 700000 rub. 650000 - 700000 rub. A path to the river.